Gastroesophageal Reflux Disease (GERD) is a chronic, often progressive disease resulting from a weak Lower Esophageal Sphincter (LES). The LINX® Reflux Management System augments the weak LES, restoring the body's natural barrier to reflux. GERD results from a weak Lower Esophageal Sphincter (LES). The weak LES allows acid and bile to reflux from the stomach into the esophagus. The LINX System is designed to augment the LES, with the aim of restoring the body's natural barrier to reflux. How Does the LINX System Work? The LINX System is a small flexible band of interlinked titanium beads with magnetic cores. The magnetic attraction between the beads is intended to help the LES resist opening to gastric pressures, preventing reflux from the stomach into the esophagus. (See Fig. 1) LINX is designed so that swallowing forces temporarily break the magnetic bond, allowing food and liquid to pass normally into the stomach. (See Fig. 2) Magnetic attraction of the device is designed to close the LES immediately after swallowing, restoring the body's natural barrier to reflux. (See Fig. 3). 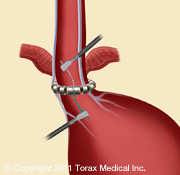 The LINX System is a small flexible band of interlinked titanium beads with magnetic cores. The magnetic attraction between the beads helps the LES resist opening to gastric pressures, preventing reflux from the stomach into the esophagus. (See Fig. 1) Swallowing forces temporarily break the magnetic bond, allowing food and liquid to pass normally into the stomach. (See Fig. 2) Magnetic attraction closes the LES immediately after swallowing, restoring the body's natural barrier to reflux. (See Fig. 3). 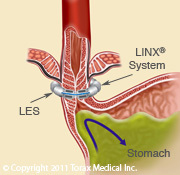 Figure 1: The LINX System is designed to help the LES resist opening to gastric pressures. 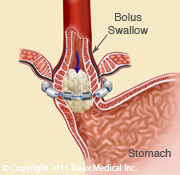 Figure 2: The LINX System is designed to expand to allow for normal swallowing. Figure 3: Magnetic attraction of the device is designed to close the LES immediately after swallowing. 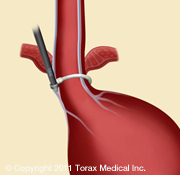 The LINX System is placed around the esophagus just above the stomach using a surgical technique called laparoscopy. (See Fig. 1-3). Figure 1: A precision sizing tool is used to determine the appropriate size LINX System. Figure 2: The LINX System is positioned around the LES using suture tails. Figure 3: The ends of the LINX System are aligned and joined for secure closure. Patients are placed under general anesthesia during the procedure, which generally lasts less than an hour. Unlike other surgical treatments for GERD, the LINX System does not require any anatomic alteration of the stomach. Because the LINX® system does not require any stomach alteration, most patients are eating after surgery and go home the same day.